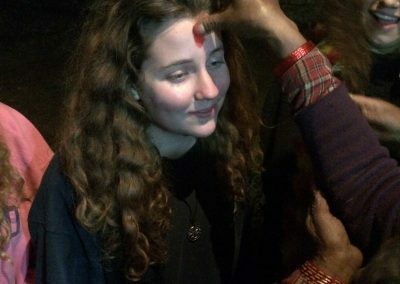 It already feels like we have been here for about 3 days but the first day of our Nepal Cultural Exchange has finally ended! We started yesterday at 6pm (Israel time), with a pretty easy check-in at Ben Gurion airport. The students had so much time to spare that they even had the chance to get their last Aroma meals or shawarmas before we hit the skies and headed to Turkey. 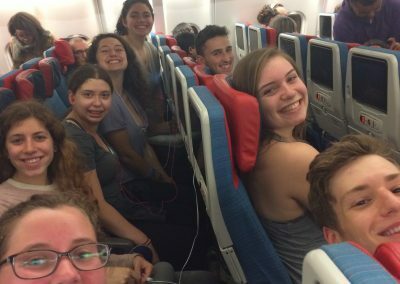 Given that we only had a short transit in Istanbul, it didn’t help at all that we got stuck on the tarmac in Israel for 25 minutes! 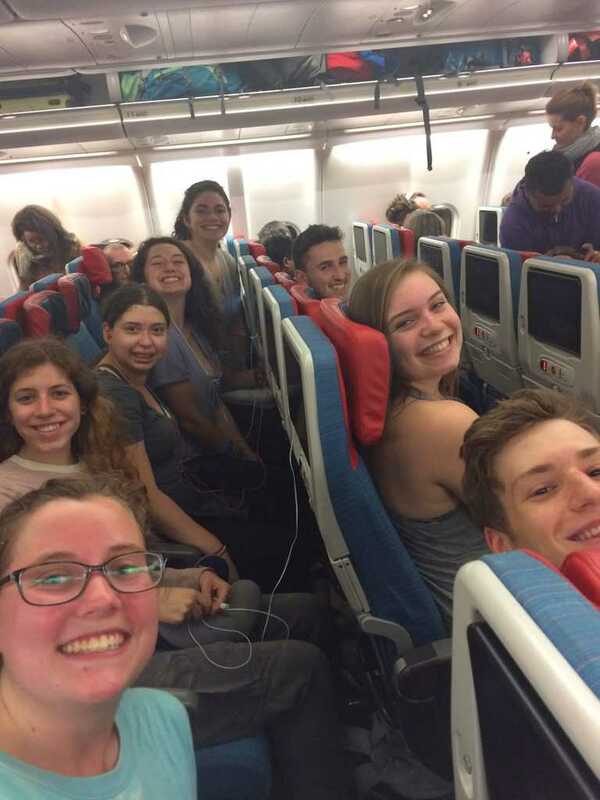 We eventually got to Istanbul, and the race was on to make our flight to Kathmandu! After a dash across the airport, we successfully got onto our flight. It’s fair to say that the students made the most of the very comfortable facilities on Turkish Airlines. As we approached Kathmandu airport, the pilot alerted all passengers that Mt Everest was visible directly out of the left side of the plane. It was amazing to see one of the most beautiful and recognised sites in the world. As we descended to the airport, we got a great view of how Kathmandu, a large and sprawling residential centre, really is based in a valley surrounded by beautiful mountains all around. 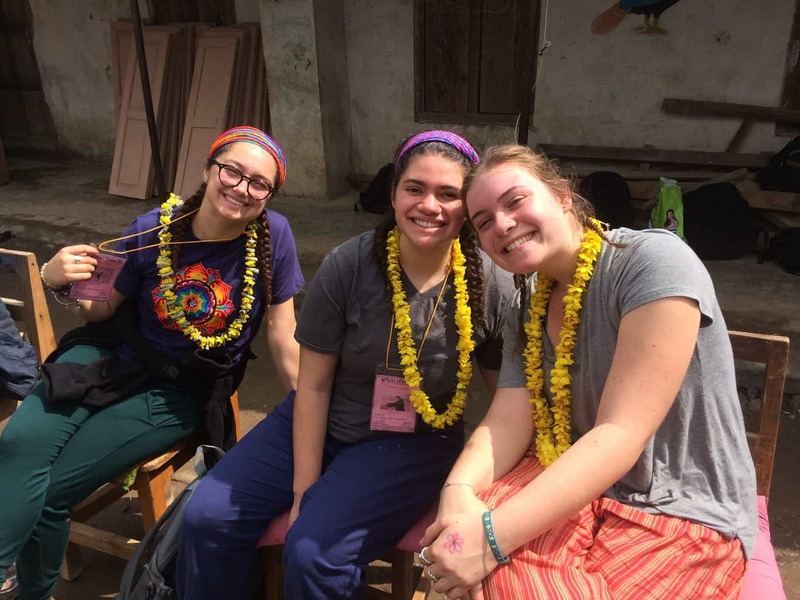 We were picked up by the Tevel B’Tzedek crew and taken to our first home in Nepal – the Tevel House. 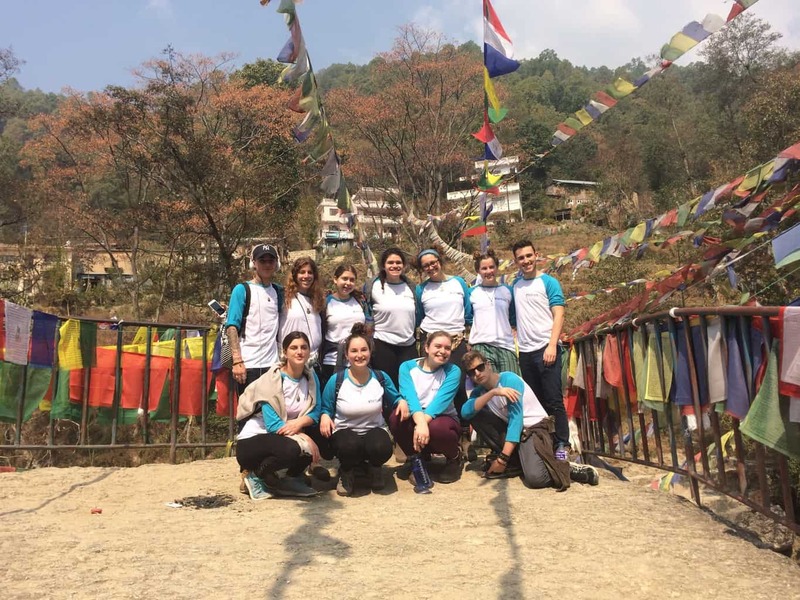 Tevel B’tzedek runs programmes for volunteers from Israel, Nepal, and students from across the world for a range of different communities and villages throughout Nepal. We were greeted with an amazing traditional tikka ceremony, where students also received Nepalese sweets and scarves. We also had our first Nepalese language lesson, which was “raamro”! (good). A little bit of Nepalese will help all of the students to interact with the villagers next week, who know little or no English. 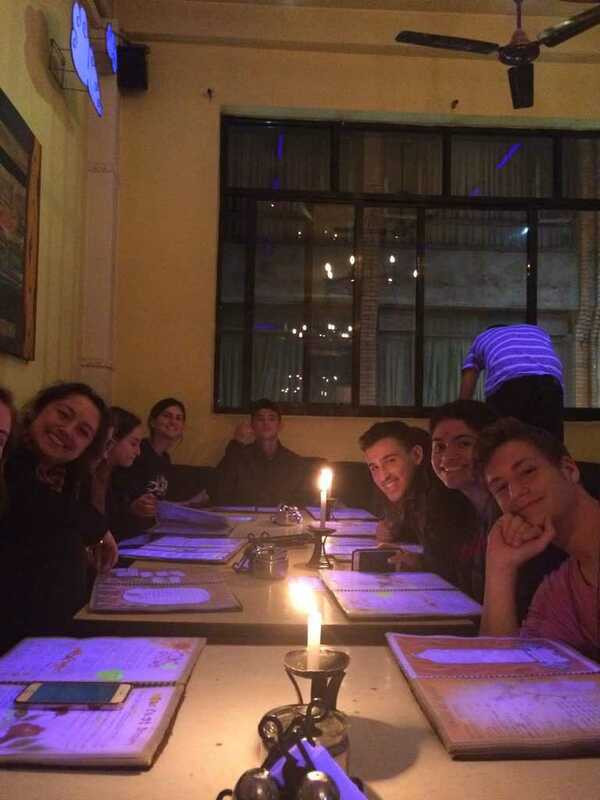 We then headed out for a special dinner in the nightlife of Thamel, Kathmandu’s main tourist area. The students ate plentifully, and then had a chance to peruse the amazing sights and smells of the shopping and market scene. There were some bargains to be had! Attached are some photos that summarise our first day. Tomorrow is going to be another great day of learning and touring in a few different areas of Kathmandu. As I mentioned in previous emails, I do have a Nepalese phone with me here. If anyone needs to contact their child in an emergency only, my number is +977-981-831-6720. 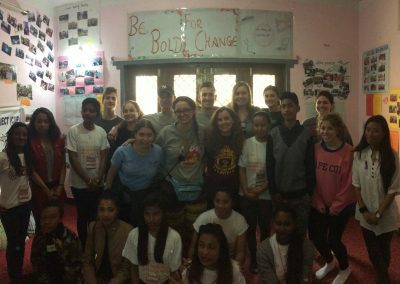 Well today has been a long, but amazing day in Nepal for the students. Our first full day in the country was action packed with learning, touring, and meeting some very inspiring locals. We began our day with our second lesson on the Nepalese language. It is amazing to see how much the students have managed to absorb in just 2 hours of learning. 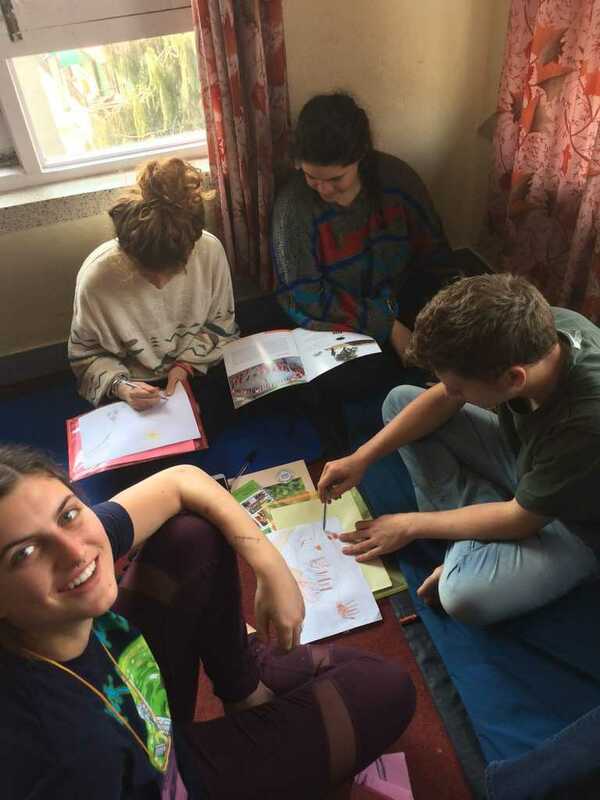 It has definitely given us all a pretty good base and some added confidence when we head out to the rural villages next week and have the chance to interact with Nepalese people who know very little or no English. We then had a fascinating session with Dr Bishnu Chapagain. He is the Nepalese Director of Tevel B’tzedek, and a truly inspiring figure. He also knew plenty of Hebrew, as he had lived and studied in Israel for 11 years! Bishnu spoke with us about the geography and history of Nepal, as well as going through some of the contemporary issues that face the country. He also explained the incredible ethnic and cultural diversity that exists in Nepal. It was a very interesting insight into the country, and helped to put a lot of things into context for the students. 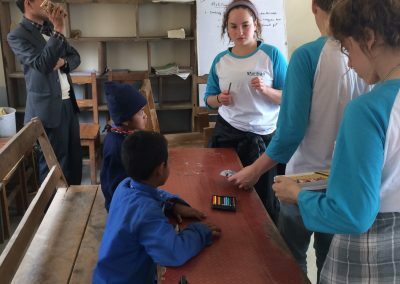 The following session was designed to help the students understand the essence and timetable of our trip to the rural areas in Nepal that we will be visiting next week. Gautam, who is our Tevel B’tzedek guide for this trip and will be accompanying us on the village visit, started with a bunch of fun games and activities that really helped get the students energised. He spoke with us about the exciting projects and activities that we will be involved in once we get to the village next week. We had lunch in the houses where we are staying and it was our first taste of Daal Baat – a traditional Nepalese meal consisting of rice, Daal, and combinations of other vegetables. In Nepalese culture, the people eat with their hands so who are we to argue with that??? The students tucked in and it was a truly delicious meal. After lunch we headed out on our first tour in Kathmandu. We started in Kalimati, which is one of the poorer neighbourhoods in the city, with many migrant workers making up the community there – mainly coming from the rural villages of Nepal to try to make a better life. Our first stop was the market, which is HUGE! It’s one of the largest fruit and vegetable markets in Asia! We then visited one of the area’s slums, which was a challenging experience for our participants, before going to visit one of Tevel B’Tzedek’s projects in action. The organisation has a youth movement and day care centre in the area, which assists children from poorer migrant families and domestic women workers. It was inspiring to hear from the workers there, and to meet some of the young leaders in 11th and 12th grade who guide the younger children. We even had the chance to play a couple of games with them – you can check the footage below. Don’t ask me what they had to do – but they sure had fun doing it! We then headed to Durbar Square, one of the central squares in Kathmandu. The area houses the old Nepalese Royal Family Palace, as well as the home of the “Kumari.” The Kumari is a young girl who is seen by the Nepalese people as the protector of the people. She very rarely shows her face, but the students were able to see her as she came to the window. It was a strange sight, as she is only 5 years old, but is revered as a holy figure among the Nepalese people. The area was also full of amazing old temples, as well as many hawkers trying to win the students’ over with their many bargains! For dinner we headed back to Thalem (where we were last night) where students could choose what they wanted to eat and were able to peruse the hundreds of different shops and stalls. Many students chose to sample the delicious Nepalese “MoMo,” which is a dumpling served with spicy sauce. Tomorrow we’re heading out early for a tour of some different parts of the city with a deep examination of the socio-economic communities in Kathmandu. We then head back to our home for some much needed rest and relaxation and to bring in Shabbat together! Today started bright and early as we had to be ready to leave our house by 7am. We headed off and were treated to an amazing Nepalese breakfast consisting of spiced chickpeas and potato, along with one of the weirdest Roti breads we have seen so far. It was basically an unseasoned churros – quite sweet and chewy but with no cinnamon on top! This was unaccompanied with a refreshing cup of tea. 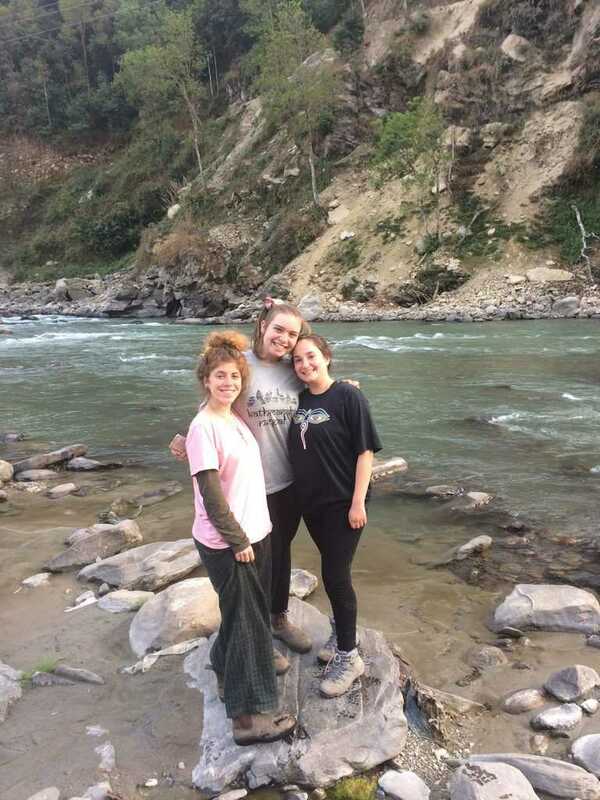 We then started a short trek into the National Park just outside of Kathmandu, which is the source of water for the Bagmati River – the largest river in Nepal and the main source of water for Kathmandu. It is also consider a holy river in Hindu culture. The water was so amazing, fresh and clean, and the park was beautiful. The students were captivated by the many goats in the area, especially the goat kids! We hiked our way down, and headed off to one of the closer neighbourhoods on the outskirts of Kathmandu. The neighbourhood stood where nothing had been just 20 years earlier, and the impact of the urban sprawl on the Bagmati River was already evident. Pollution, rubbish and even sewage has negatively affected the Bagmati in a very big way, even in one of the peripheral neighbourhoods. We continued on to the central Hindu temple, which sits closer to the city centre on the Bagmati. This temple is the holiest site of Hinduism in Nepal, and sees thousands of pilgrims from India every year. It is estimated that its oldest parts are between 3-4,000 years old. We were told that bodies are cremated along the river, and could see fires in the distance as we walked past. It was indeed a culture shock! 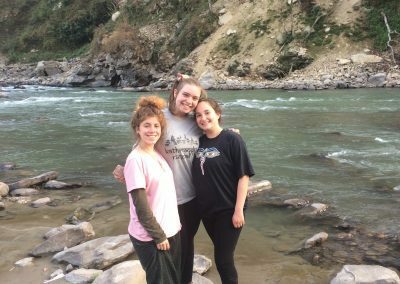 We finished our river tour on the opposite side of Kathmandu, at the final gorge of the Bagmati River as it winds its way towards India. The water was completely black and polluted, and rubbish littered the shores. It was sad to see the impact of the sprawl and growing population in Kathmandu, especially given how beautiful the waterfalls and river were when we saw them earlier in the morning. After lunch, we had a chance to visit the day-care children in the centre that we went to yesterday. 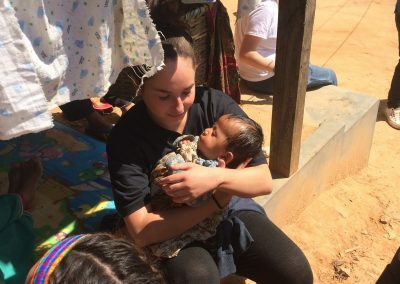 It was amazing getting a chance to play, sing and dance with some of the smallest and cutest Nepalese children, and it was a wonderful note to finish on before heading home for some much needed rest and relaxation before we bring in the Shabbat together. I wish you all a Shabbat shalom, and will be in touch again tomorrow! Shabbat was definitely a nice and relaxing time for the students, enabling them to catch up on a bit of sleep and prepare for the exciting week to come. After a well-deserved lie in, we trekked out from our house to the nearby Swayambhunath, or as it is known to most tourists – the Monkey Temple. The temple actually consists of a number of different temples and shrines, and a huge array of both Hindu and Buddhist holy sites. One of the incredible things we have learnt in the past few days is that over 40% of Nepalese families identify as both Buddhist and Hindu, so many of the holy sites reflect this co-existence. And of course, there were hundreds of monkeys around us! It was a real experience for the students to be surrounded by so many monkeys and see them interact with each other. We walked back home to another delicious Dahl Baat meal for lunch, and had a learning session about Judaism and Tikkun Olam. We also spoke about Globalization and the positive and negative impacts it has had on the world and us today. 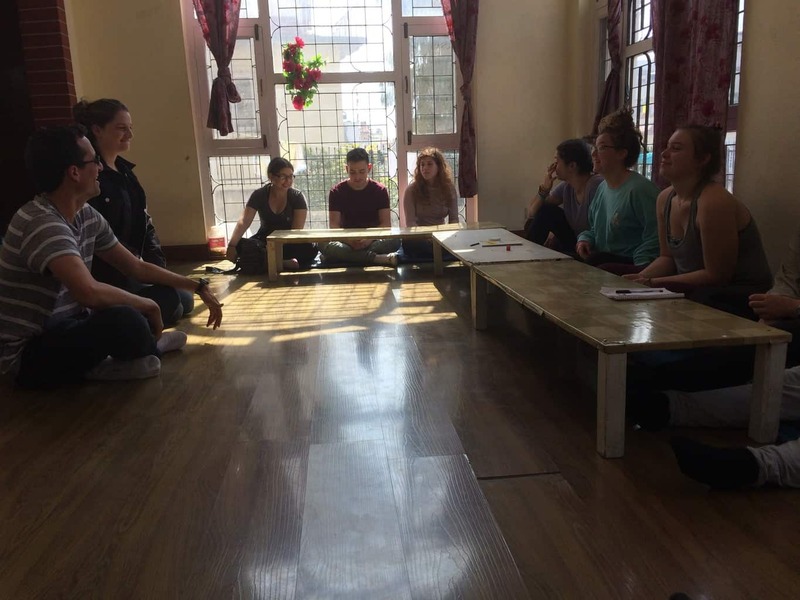 The session ended with students reflecting on how their first few days have been in Kathmandu, and what they are excited for in the week to come. Tomorrow we’ll be getting up bright and early, ready for our 6:20 departure to the village that we will be volunteering in for the next 4 days. The drive will be around 10 hours altogether! Although we will be having stops for meals and taking in the amazing sights as we wind our way up the mountains and towards the Himalayas. It is going to be a breath-taking journey! Today we had a bright and early start as we prepared to leave the “big house” in Kathmandu and our home for the past 4 nights. We set off around 7:30 to Dolakha – a region of villages where we will be volunteering in the coming days. The journey was long – even though it was less than 200 km from start to finish, we travelled in two jeeps and the majority of the ride was on dirt roads. 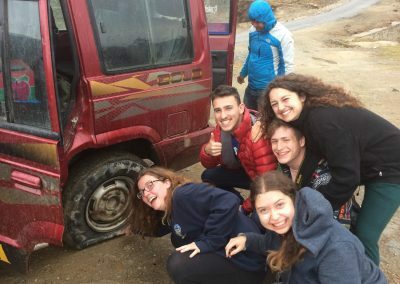 We stopped for meals along the way, as well as toilet breaks, a shopping expedition for some snacks while we are away from the “big city”, and even a tyre change! You can see the evidence in the pictures below! The journey was full of wonderful views of the amazing mountain and valley region that we will be staying in for the coming days, and no matter which way we turned, we were graced with breath-taking views of the Himalayas and the mountain communities that reside in them. At one point, there was also snow on the sides of the road, which was an exciting experience for a number of the students! After travelling for almost 12 hours, we finally reached our destination. We were treated to a wonderful introduction ceremony, and fed with our regular favourite – Dahl Baat. 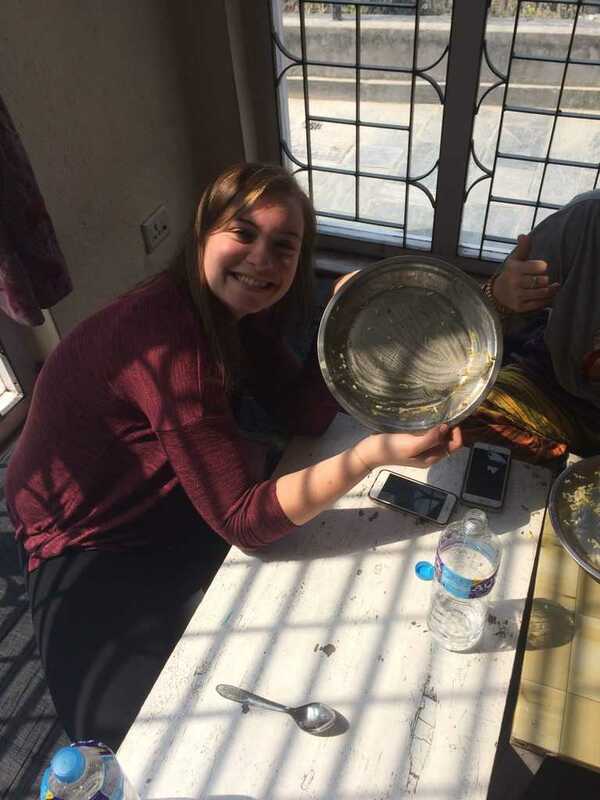 The students are becoming very adept at making sure that they finish all of the food on their plate, as the Nepalese try to make sure that they have as little waste as possible when it comes to food. Tomorrow is our first full day in the village, and it is going to be an exciting time getting to see the villagers and the Tevel B’Tzedek workers who will be alongside us, as well as the projects that we will be involved in during the days to follow. Today was our first day in the Dolakha region and it was full of wonderful first sights, experiences and meetings. 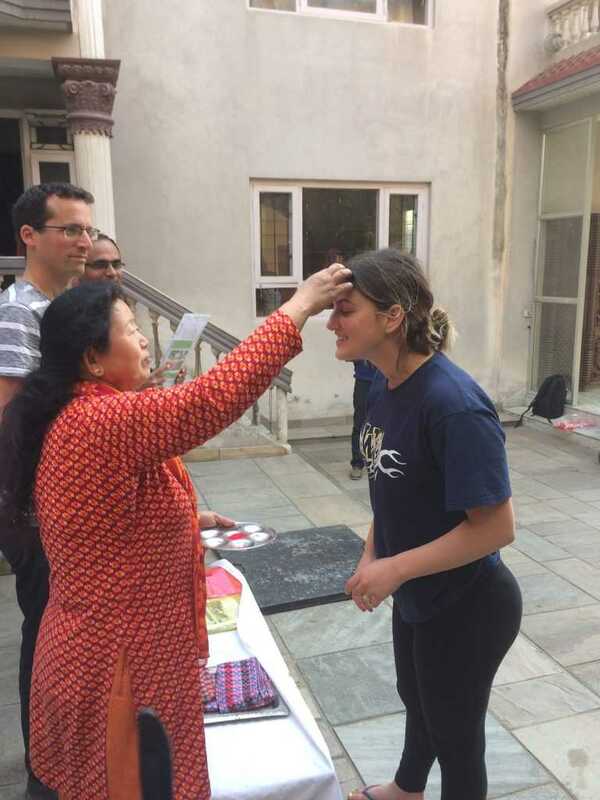 Even waking up was an experience for the students, as they stepped out of their rooms and could immediately see a gorgeous view of the foothills of the Himalayan mountains, and the terraced fields of the villages that lay before them. It’s definitely hard to wake up grumpy in this place! After some delicious tea, and morning snacks, we got the chance to sit down and chat with the Tevel B’Tzedek staff who work in the village and will be assisting us in our visit. We did an expectations session, with some important messages coming from the students. The staff were fantastic and responded really well to our expectations, and are doing everything they can to enrich the experience of the students for the village and the people within. We then headed off to have our first Dahl Baat for the day, which is quickly becoming a much-loved culinary experience for the students! Today was spent in 2 groups, with each group of students joined by some of the local youth leaders from the village. 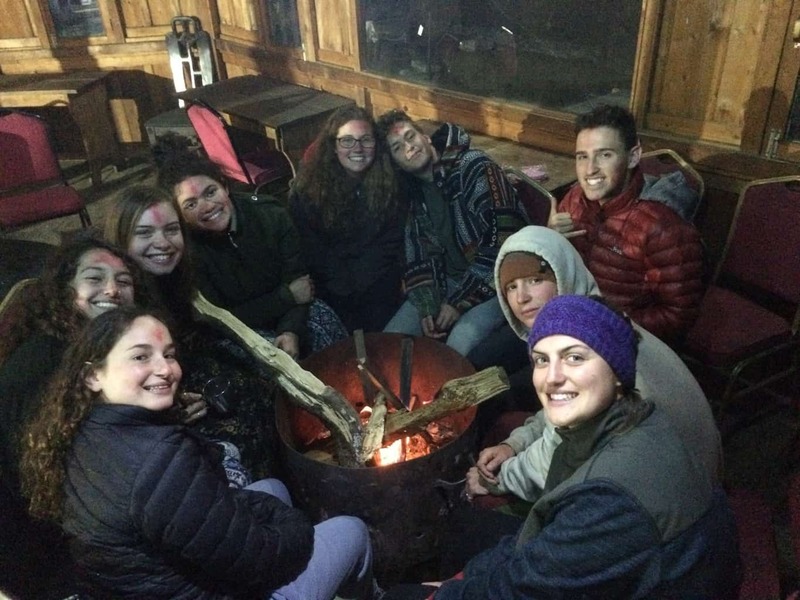 Each group wound its way through different paths and areas, and were treated to some amazing sights and met some fantastic people, as well as witnessing some of the fantastic projects that Tevel B’Tzedek are doing in Dolakha. A visit to the “Health Post” – the local hospital (which is more like a first aid station), and a chance to see the many women workers in health posts from the region who had gathered there for a monthly health report. The Tevel B’Tzedek Fresh Produce Collection site – a project aimed at helping the region’s farmers store their produce and sell it to the markets. A visit to the only bee-keeper in the region, and a chance to taste honey straight from the hive! Visiting schools and seeing the local children and the way that they learn together. Numerous visits to different homes of villagers and their families, and some of the most wonderful hospitality you could ever ask for! It was a truly inspiring day, with the students gaining many new insights and a deeper understanding. Probably the most important part of today was the Nepalese youth leaders who joined our groups. 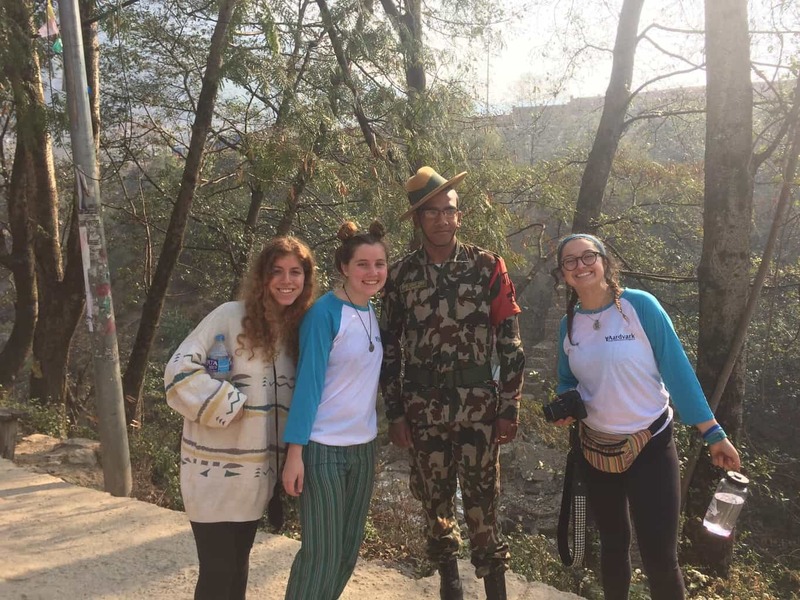 They spoke about their lives and asked many questions about the Aardvark students’ lives, helped them to strengthen their Nepalese language vocabulary, invited us into their homes, and even held our hands as we descended some of the muddier paths so that we didn’t slip! They definitely helped to make the Aardvark students feel at home. Once we finished our tours, the 2 groups met up for a few games and fun activities. The groups battled it out in a few contests, including a Piñata style game where they had to hit a suspended pot while blindfolded to break it and release the treasure within. 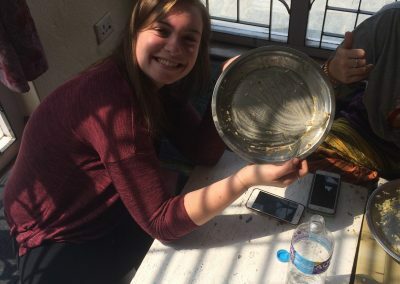 It seemed like no one was going to succeed in breaking it, until Sydney Feldman stepped up, and with absolute precision, nailed it with one swipe! It was amazing to see the Aardvark and Nepalese students celebrate together, and they all enjoyed the chocolate and sweets within. 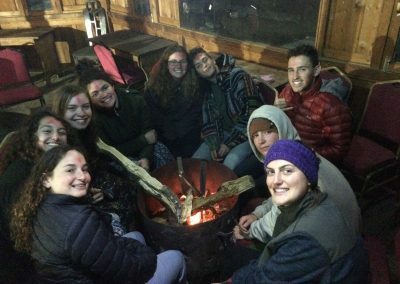 When we returned to our home in the village, we sat with the staff to process and summarise the day – something that we will do every night in Dolakha. Then we sat down to another delicious meal of our favourite Nepalese delight – Dahl Baat! Waiting for us tomorrow is another wonderful day in one of the most picturesque regions of the world that we have ever had the luxury of visiting! Today was another glorious day of immersion in Nepalese village society complete with breath taking views. Every day that we stay here makes it harder to leave! After getting to know the village and its people yesterday, today the students started doing their projects within Dolakha. Today we ventured out to a local primary school in the area where the students were divided into two groups. 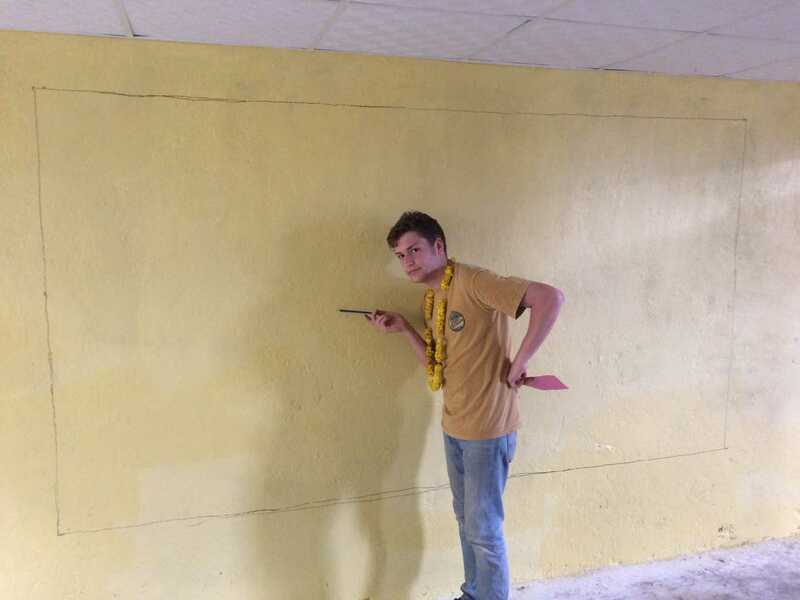 One group was responsible for painting murals and learning aids on the walls of one of the new classrooms, and the other was involved with the extra-curricular activities that the schoolchildren were doing. Once the schoolchildren’s activities were over, that group joined up with the painters. The painting group, led by the outstanding artistic skills of Efi Masliansky, created some amazing wall features for one of the school’s new classrooms. It was very challenging work at times, but the students definitely left their mark with one side of the room featuring an alphabet reader for the students, and the other with a portrait of the school itself. You can see some pictures below. I’ll send an additional email with more photos so that hopefully you won’t have problems viewing them. Tomorrow we have an early start and will be doing some work on the agricultural side of Dolakha before heading to a different school in the afternoon for some exciting new projects. Today was definitely one of the most physically demanding days we’ve had so far on the Nepal trip. We started bright and early, heading off at 7am to one of the local farmers’ fields to assist them in preparing and planting a new tomato crop. The field was sheltered, and our guide explained to us that growing tomatoes in the wet season (which is not the season they are usually grown in) allows the farmers in the rural villages to generate more profit, and also varies the diet within the village. We carried heavy bags of fertilizer, before tilling the field and raising the beds for the tomato plants. We then dug holes, mixed the fertilizer with enriched soil mixtures and finally planted the new seedlings. Needless to say, we got very dirty! But at the end of it all we were able to wash away the dirt in one of the most beautiful taps we have ever seen – a water outlet directly from the stream. We were then treated to some tea and biscuits with the families that we worked with throughout the morning. In the afternoon we headed out to a different school from yesterday, where we took on a number of different projects. Some students assisted some of the 3rd and 4th graders in a drawing competition, and then also judged their work for prizes at the end. Some students helped with the creation of a new table tennis table for the school, and then we all joined forces with the students to help with a big clean up of the school grounds. In Nepal rubbish on the streets is pretty commonplace, so assisting with and guiding the collection of trash is not taken for granted. This evening after dinner, the students were given the option of visiting a local celebration ceremony for a family who had just finished building their new home. It was an extra special celebration because this family’s home was destroyed in the earthquake a few years ago. Most of the students took up the offer to go and celebrate, and it was an amazing experience! As soon as we arrived we were ushered to the front and danced with some of the local Nepalese community. After dancing for a while, we were brought inside for more food! We were told that it was traditional celebration food, and the pick of the dishes was a sweet rice pudding that was delicious. The hospitality and welcoming nature of the Nepalese villagers is truly humbling. Tomorrow we are sadly leaving Dolokha, which has been our home for the past 4 days. We are heading to Kalinchok, which is a base camp for the Kalinchok Mountain. We will be hiking up the mountain trail in the early hours of Friday morning. I’ve attached some photos, but will add a few more in the coming emails. I apologise for not writing to you about our day yesterday. We were staying in the Kalinchowk base camp, which is about 3300m above sea level. Unfortunately there was no reception or Wi-Fi – but trust me, everyone is safe and sound and still having a wonderful time! Yesterday morning we left Dolhaka, where we had been staying for the past 4 days. It was an amazing experience, and just as we were welcomed with a tikka ceremony, there was another to send us off. It was a bittersweet feeling, but as they say, all good things must come to an end. And, as much as I’m sure that the students were able to make a positive impact on the community of the village, I’m even more certain that the village was able to make a positive impact on the students. After stopping for some lunch and a visit to the biggest temple in the Dolhaka region along the way, we reached the Kalinchowk base camp in the mid-afternoon. Kalinchowk is a mountain that stands almost 4000m above sea level, and the base camp is a small village, made up of a small number of villagers, and a large number of hostels and inns. It was also much colder than it was in Dolhaka! Thankfully, there was a large clubroom that had about 4 separate fireplaces, so students were able to take their shoes off, put their feet up, and get warm quickly! 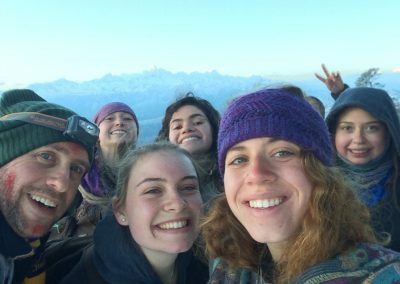 We all went to bed early, because we needed to be up at 4am for our climb up Kalinchowk. Many of us were woken by thunder overhead at around 2am, at which point we all thought that there is no way we would be walking. But by 4:30am, when our hike started, the clouds had cleared and we were greeted outside by about 2 inches of snow! It was an amazing sight, especially for those of us (myself included) who come from areas where you rarely, if ever, see snow. The climb started in darkness, and we headed out with our flashlights, it took us just under 2 hours to complete the almost 600m ascent. While it was difficult for most of us, the sight that greeted us was truly spectacular. It’s even hard to put into words. We could see the range of Himalayas beyond as the sun rose, and it just took our breaths away. After some tea at the top, and a quick visit to an amazing old temple on the mountain, we headed down. Once we got to the bottom, the snow fight was on! Snowballs were flying left, right and centre, as the students, myself, and even the Nepalese staff, got into some serious snowball throwing and evading. It was an amazing way to finish what had been a spectacular start to the morning. We headed back to the hotel to have breakfast, and then started the long journey to Manegau, which is where we will be staying over Shabbat. Manegau is a small village about 2 hours from Kathmandu, where we will be hosted in the homes of Nepalese families. It is going to be yet another amazing experience, in what has been a trip full of them so far! I’ve attached a few photos, but will send some more once Shabbat goes out. Today we had a nice and relaxing day, and got to know the village of Manegaun and its inhabitants. Manegaun has a number of Tevel B’Tzedek projects running, including the development of tourism in the area. In order to accommodate this, the village has a home stay option, where guests are hosted in the villagers’ homes, and are treated as one of their own. We are lucky enough to experience what goes on in Manegaun just like the people who live here do. This morning the students got a well deserved chance to catch up on some sleep before we headed out together to explore the village and its surroundings. We visited some of the families and were shown the sites of a few of the homes that were destroyed during the earthquake in Nepal in 2015. We then headed out of the village to a famous temple in the area called Namobuddha. We started in the lower temple, which is said to be the place that Buddha died, and then headed up to Namobuddha. It is truly an exquisite and intricate temple, with amazing artwork throughout. Sadly we were not permitted to take pictures inside, but you can definitely ask your children for a graphic description! After a really nice day exploring the area, we headed back to the village for a bit of rest. As dusk set in, we headed out to set up a campfire for the night to share with the youth of the village. Mikey Anfang’s supreme fire-making skills really came to the fore, as he broke up large logs and set about making the most amazing fire with some help. As night settled in, we started the fire and danced along with the local youth. We were also given some traditional Nepalese dance performances by the local youth, which was really exciting for the students. Tomorrow we head back to Kathmandu for our final day in Nepal. It’s crazy to think that we’ll be heading home to Israel on Monday – it feels like we have been here forever! This morning we woke up in our home stay families’ homes, to the sounds of chickens, goats, cows, dogs, and almost every other animal you can think of. 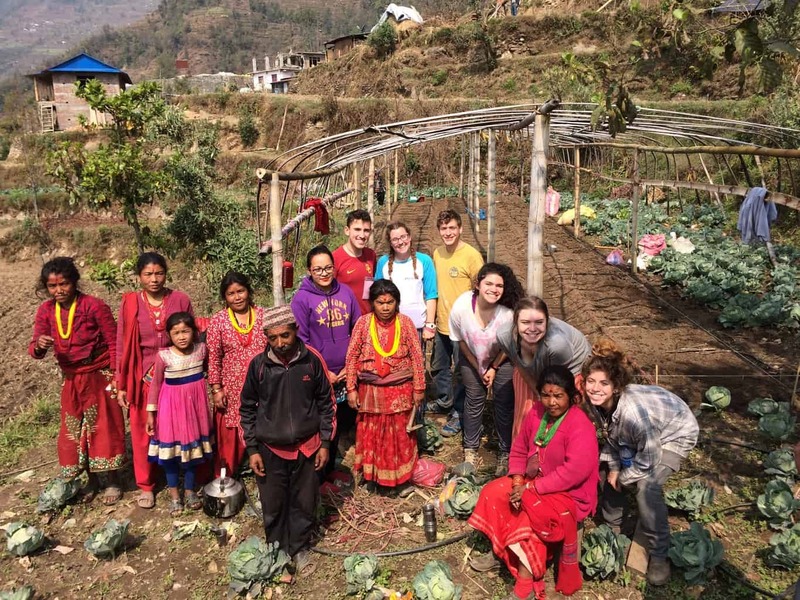 Living with a family in the rural villages of Nepal is definitely an experience! We were treated to breakfast and then met for a farewell ceremony before hitting the road. The homestay was definitely a special experience for the students. A few hours later, we were back in the big house in Kathmandu where we stayed when we first arrived. It was a bit like a homecoming, and the students ran straight for the hot showers! 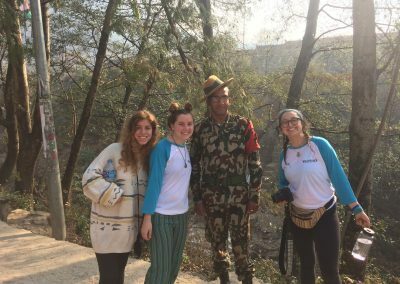 It was definitely refreshing to be back in the urban jungle of Kathmandu, and we started to put things into perspective for the students about their experiences in the rural villages of Nepal. After a delicious lunch, we had a session about the connection of Judaism and Tikkun Olam to what we have been doing over the past two weeks. 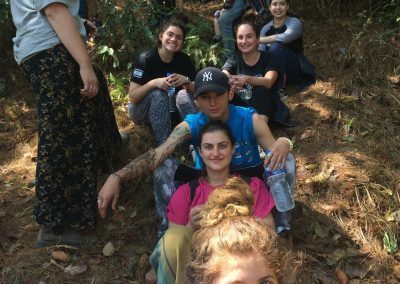 Each person spoke about one thing that they feel will change for them when they go back to Israel after their Nepal trip, and one thing that they will never take for granted again. Students brought up things like reducing waste and only buying as much as they need, also about attitudes to other people and friendliness, and also about using their time to the maximum. Amongst the things that we won’t ever take for granted again are hot showers, internal plumbing, a range of meal options in close vicinity, the ability to travel, and education. It was a really awesome way to begin to digest everything that we have been through so far. This evening we headed back out to Thamel, and we ate dinner in the same restaurant as on the first night of the trip. It truly was a full circle for the group! The students also got the chance to shop and buy gifts for themselves and their loved ones. I hope they also were buying things for their parents! Tomorrow morning after breakfast we have a short wrap-up session, before heading to the airport. So I guess this will be my last full wrap of the day, but I’ll keep you all posted as we head back to Israel, and when we arrive home.